I bought this a few years ago. I just couldn't resist as I love the Fox and wondered what this kit was all about. It's a cheap copy but has a few nice touches that make it better than a Fox in some ways. As far as I know these kits were sold here in the UK as an illegal, but cheap alternative. I've seen copies of the Supershot also but not sure what else was copied, if any? 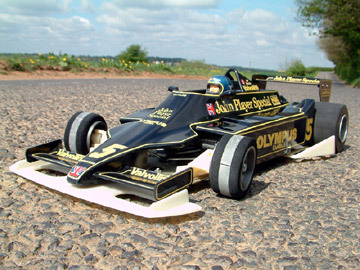 The rear end is protected by a nice gold alloy roll cage and has a wire mounted rear wing that looks like a Supershot wing. And, it comes with front and rear stabilisers as standard which are nicely tucked away. The quality of the plastics and lexan are nowhere near as good as Tamiya and there's no moulding info on them at all. I've even broken a few things during build as it's also an old kit and feels very brittle. The top of the main chassis is a strange brown colour. The mechanical speed controller is very crude along with a home made BEC circuit board and switch? Drive shafts are very loose and wouldn't last long I bet. The Tamiya name has been removed from the gearbox cover also. Battery door has had the hinges removed and slightly moulded differently to screw straight on as you can't fit a hump pack battery in. Rear shock mount is alloy and not fibre glass. No driver is included but I'm thinking of using a Frog one? Even the bottle of damper oil and tube of grease have been made to look like Tamiya's. As far as I can see the only item in all the kit that gives away where it was built is the tube of 'Shian Tai' grease - 'Made in Taiwan'. The standard wheels are just cheap yellow plastic and I couldn't resist putting some Fox ones on for the photo shoot. 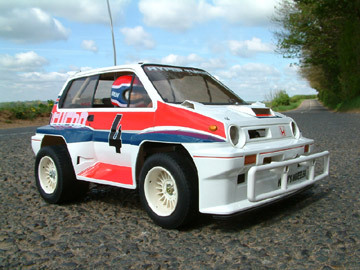 The kit front bumper has strangely been copied from a Kyosho Optima. So I've changed that too to complete the look. Enjoyed building it though and put my twist on it as the box art is terrible! Re-pro decals (with blue trimmed off) with a nice graphite grey body colour, all to go with the gold on the chassis. The question is, do I keep it or not? Not worth much to be honest as where's the value? 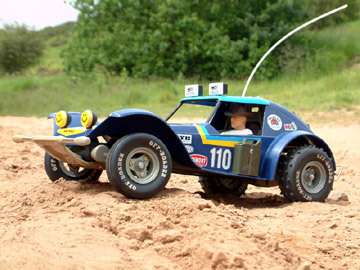 And Tamiya have now annouced they are re-releasing the 'Nova Fox'. I'm not going into much about the build process as it's all straight forward and the manual is a total copy of the Tamiya one. There were screws missing, but it pretty much went together like a Tamiya kit ok.
Have a good look at the pics and enjoy! I came across a copy of the Holiday Buggy a few months ago. 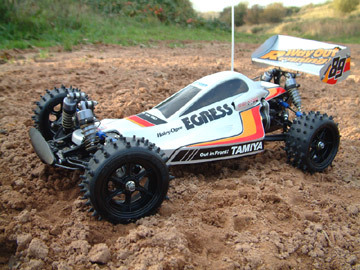 Front and rear is identical to Tamiya, but chassis ws different. It uses normal AA batteries and has a little speaker in front. 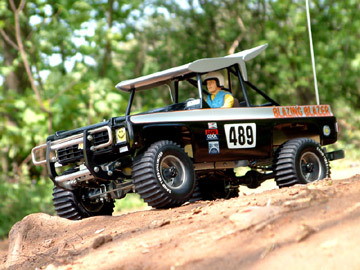 I thought it was a QD at first, but the radio was not Tamiya branded and nor was the chassis. We've heard of Super Shots, Super Hornets... and now Super Fox!!! Actually, the name "Super Fox" was used by Nikko already. Most of the plastic parts look identical to the original. Good improvements where the original Fox was lacking, in particular, the rear metal skid plate/roll cage for the motor, and the stabilisers which was really needed for the original Fox's front end. Love what you did with the wheels, bumper, and stickers. The MSC actually looks like a 100% copy of the original too but I can't really be sure without a better pic. THE Super Fox! Keep it mate! PS: Where can I find myself a NIB taiwan Fox copy-cat? Looks very cool to be honest! I think you did a good job matey. The gold wheels really work well with the gold alloy detailing. I seem to remember these being sold in Maplin but i could be wrong. I also seem to remember a Hornet copy as well. Weird how these kits that are so obviously a rip off of Tamiya were being sold by high street stores. I guess they did what they needed to in order to avoid the Tamiya lawyers.